I adore Christmas and everything about it, but there are a few things that I think make Christmas particularly special. So I thought I'd create a tag so we can all share the things that really make Christmas special for us. Pigs in blankets! I know you can technically get these any time of year, but in my house we cannot have a Christmas day dinner without pigs in blankets and if my mum and dad dared to try and leave them out I think my brother would go on the rampage! Cheeselets, or this year TREESELETS! Who would have thought that my favourite cheesy biscuit (they are biscuits right, not crisps?) just being reshaped into Christmas trees could make me excited enough to let out a little squeal and actually do a little happy dance. I know Christmas is on the way when our house slowly starts filling up with tubs of Cheeselets as mum stocks up for me and my brother. Even better this year, he's moved out, so they're all mine! A slightly more unusual one is Lebkuchen. If you've never heard of these before they're traditional German baked Christmas treats that are a little like gingerbread. I believe they can come in slightly different forms but the ones I have are star shaped, covered in either a white or brown thin crisp icing with the bottoms dipped in chocolate. I've been eating these since I was a teenager and I love them. I love Christmas markets! Wandering around browsing the little trinkets carved out of woods or made of glass, choosing which sweets to buy and wondering whether you can get away with having a huge hot chocolate, whatever form of roast meat in a cob/roll/bap (delete as regionally appropriate) they have on offer and a crepe/waffle. Five years ago my boyfriend and I booked some coach tickets to head to London for a conference, but the night before I was ill and we were unable to catch the coach. We contacted the coach company and they were kind enough to let us transfer the tickets to use on another date so we decided to take a trip to London close to Christmas to look at the lights etc. When we got there we were delighted to find a huge German Christmas market (I think it might be called Winter Wonderland) that opened in the evening. It was obviously packed but we had a wander round and I spent all my boyfriends money stuffing myself with all the food! 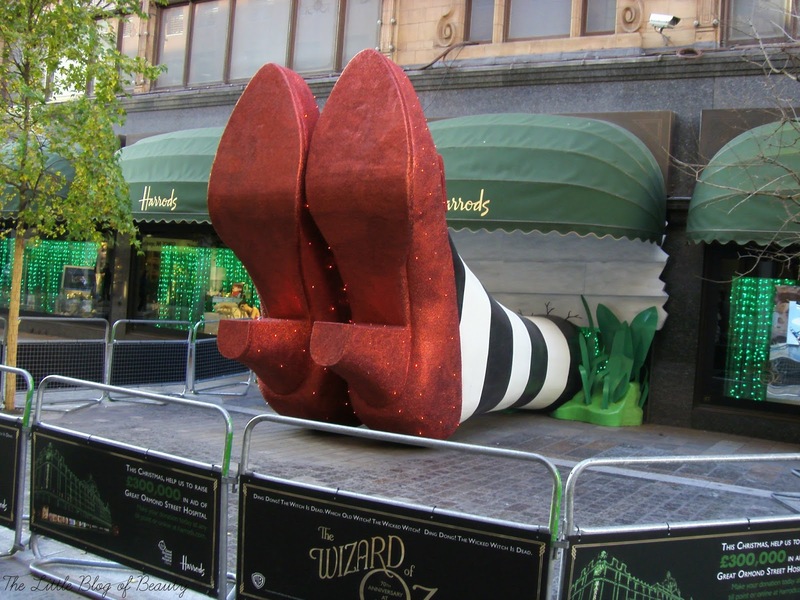 It was while we were wandering round London beforehand visiting some famous shops that we discovered that Harrods had landed on the Wicked witch of the west. Ever since I can remember I've got excited about the Boots Christmas catalogue being released. I don't think it's as good now as it used to be, but I can certainly waste some time flicking through looking at all the gorgeous Christmas gifts. I'm not buying any gifts from Boots this year for anyone, but there's no harm checking out what bits I might want to try and grab in the sale after Christmas! Christmas adverts have become a huge thing now and each year there's competition to see who produces the best Christmas advert. I think this has probably come from the Coca Cola Christmas advert. Although they use the same advert every year there's no need for them to produce a new one as there would probably be uproar if they did! I actually wrote this post at the beginning of November and was almost bursting with excitement for the début of the John Lewis Christmas advert. Lasts years Bear & Hare advert did make me cry every time I saw it but I don't think it was quite as good as the one from the year before, where the snowman trekked to John Lewis to buy winter woollies for Mrs Snowman (I'm even getting a bit tearful thinking about it!). Marks and Spencer also had a very good advert last year with an Alice in Wonderland theme with David Gandy, Rosie Huntington-Whiteley, Helena Bonham Cater and a little white Scotty dog. Although I do like Monty the penguin I still don't think it beats Bare & Hare or The journey (the snowman one) and I'm actually a little disappointed with this years adverts. The retailer that disappoints me every year is Harvey Nichols, as they do make Christmas adverts but they only put them online, hoping they'll go viral. In 2012 I was actually in their Christmas viral and it was quite a good concept and good fun to film, but even now it only has half a million views on Youtube. If you want to see it just type 'Avoid a same dress disaster' into Youtube. So this isn't one that I, or anybody else, has any control over, but I think even people who aren't very keen on snow usually would love to wake up on Christmas day to at least a little. Even if it can't actually manage to snow, a nice thick covering of frost would do just to give everything that lovely white Christmasy look. It's actually only been four years since we last had a white Christmas with a reasonable covering (rather than the one flake falling on certain locations like Buckingham Palace that technically makes it a white Christmas!) but fingers crossed for this year.